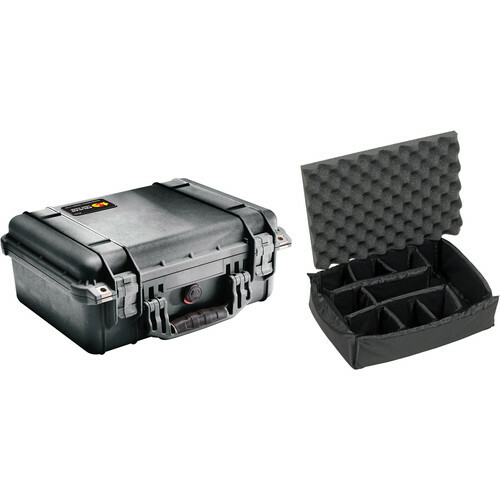 The Pelican 1450 Case with Dividers (Black) is an unbreakable, watertight, airtight, dustproof, chemical-resistant and corrosion-proof hard case used to carry any kind of equipment that needs to be protected from the elements. It is made of Ultra High Impact structural copolymer that makes it extremely strong and durable. It includes a 0.25" (6.4 mm) neoprene o-ring, easy-open double throw latches that seal perfectly, and an automatic pressure equalization valve for quick equalization after changes in atmospheric pressure. The case has a comfortable rubber over-molded handle. This case includes an 8-piece divider set. Box Dimensions (LxWxH) 16.7 x 13.9 x 7.2"
1450 Case with Dividers (Black) is rated 4.8 out of 5 by 65. Rated 5 out of 5 by Anonymous from Perfect for travel/protection I carry two cameras in different cases of this model (different colors). The case allows you to change the dividers as you see fit, and protects equipment against almost any event. The construction material is very strong, but it is convenient to open and use. It also has two molded openings to place locks. If you fly, the box has a pressure release valve to help open it. I would recommend it for any serious photographer to protect your gear, store it during travel and keep everything organized. I have found nothing I don't like about it, other than it is a little heavy...but well worth it considering the protection offered. It is very tough. Rated 4 out of 5 by s_a_h from Better Camera Protection Pros: B&H Photo had a sale and free shipping. It houses my D700 without MBD-10, and 6 primes (24 1.4, 20 2.8, 35 1.4, 35 2.0, 50 1.4, and 50 1.8). Also can hold 70-200 2.8 and 3 of the primes and body mentioned. Great for situations when protection matters more that ease of transport that a backpack or shoulder bags offer. Cons: Poorest quality dividers I have ever seen in a camera case/bag. Buy case with dividers is much cheaper than buying them later, plus high cost of shipping. I have an older version of this model. This model seems harder to latch. It does have the metal clips over padlock holes that older version lacked. Rated 2 out of 5 by Dan from Dubious Smell I have bought at least two of these in past years, both of which were great in all respects. The one I just bought came with dividers that are all black (not gray as before), and I think are made out of a different material. The smell coming from this case, likely from the dividers, is really bad. I thought it would go away but it hasn't (even after airing it out for a couple of weeks). The case doesn't close quite as smoothly as the ones I had bought years ago. Perhaps the overall quality of the case and especially the dividers has declined. It's too late for me to return it, so I donated it to Goodwill. Rated 3 out of 5 by Bob from Should have gone with pick and pluck The case does what it's supposed to, but a few negative comments: 1. The dividers don't work all that well, I'm trying to put two body/lens systems in there and the dividers aren't flexible enough to deal with it. 2. The case is about 3/4 to shallow. I can put the bodies in, but if I put the battery grips on, they are too tall to fit inside without laying them down. Sidewise they are a tight fit, but I don't trust the water tight seal. 3. The latches open easily, but are real stiff to close. Not something that is easy to do one handed. Unfortuntely nobody makes a case that's just a little bit bigger. I manage with it, but it's not perfect. I think going with the pick and pluck would have been a better idea. Rated 5 out of 5 by Anonymous from Perfect fit Don't let the size of this case deceive you. In my case I store: -Canon T1i with BG-5 installed and EF 24-70 f/2.8 lens ON THE CAMERA (so I'm ready to shoot) -Lens hood -memory cards, card reader & USB cord for reader -2 77mm lens filters -lens cleaner solution & microfiber cloth -mini-tripod -battery charger, extra battery clip for BG (holds AA's), bag with a dozen AA batteries in it -video cable & USB cable that came with the cam -neck strap (I use a hand-strap with the BG on) Case is not huge like other Pelicans can feel & the dividers are super easy to move around. I still have space to spare & when I get my next lens (50mm prime) I'm sure it'll fit just fine. Oh, and it's a Pelican - need I say more??? Rated 5 out of 5 by Richie Guz from Awesome Waterproof case! I bought this because I travel a lot. Diving is #1 reason I bought it for! When on boats, things get soaked, this will allow me to bring a DSLR out on the boat and put it away while diving and not worry. I recently went fishing! This case rocked! I was able to literally throw it down on the wet dirty bottom boat and not worry about it. It rained 2 inches on our 2nd day and was completely dry! things fell on the case and it stood up. I kept 1 camera (and small lens on the body) with 2 other lens to change out and still had room for 2 GoPro's. Normally it holds 2 DSLR's body and 4 lens, all separated for my trips. I love the fact that there was different colors to choose from. Rated 5 out of 5 by Diana from Perfect for many photographic/video accessories I decided to finally better organize in one safe place all my filters, step-up rings, lens adapters, extension tubes, shutter releases, hot shoe adapters, AA/AAA Eneloop batteries, and other small photo items that could be used with more than one of my cameras or related gear. The padded dividers in this well-made case were very easy to adjust to my exact needs. I chose the Orange case so it would stand out from all my other cases and bags. I'm sure the padded dividers could be arranged to hold lenses but I feel it's better to use a foam insert for those. In summary, I am very pleased with the size, protection, and ease of organization this case provides for my small accessories. Rated 5 out of 5 by Nathaniel P. from Awesome! Bought this as a smaller, lighter, and more compact companion to my 1510 Roller, so I could use it to house one body, two lenses, and accessories on an upcoming arctic canoe expedition. My second body is carried in a padded insert in a waterproof daypack. This pelican will fit underneith the bow or stern seat of our canoe and provide waterproof and shockproof protection but with easy access at a moments' notice - all necessary on a trip of this kind. I have to say I am impressed at how much I can actually fit inside - it's basically a perfect basic photo kit in one lightweight package. Where I hauled the 1510 with all sorts of extra gear last year, this will cut my weight in half and still allow me to bring everything I need and nothing more. It may, but would likely stick out far enough that they would give you trouble about obstructing pathway. It definitely fits in the overhead with no problems at all. Can this unit hold a NIKON D90 with attached 18-105MM lens, light meter and a few small things? Your thoughts.